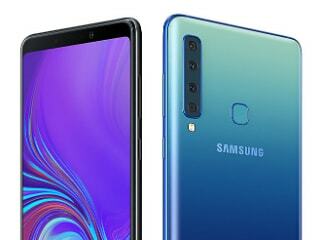 The Samsung Galaxy A9 (2018) is the world's first quad-camera smartphone, and also represents a striking new aesthetic for Samsung. However, the rest of its specifications are weaker than other phones it's priced up against. If you're buying it just for the cameras, you should know that the zoom and wide-angle cameras don't deliver very good results, especially in low light. The primary camera works quite well though. Battery life is good, and the 6.3-inch display is this phone's biggest highlight. The SoC is weak, and you don't get flagship-class features. Buy this phone if you like new features that you can show off and play with, but avoid it if you want an all-rounder. The A9 is the best phone so far for it's price because it gives the widest camera in the market and it's perfect. i'm a 10 year old that has training everyday and I take it every where. It is the PERFECT smartphone for it's price. The first impression is excellent.After 8 days of use i have the following remarks:-The front camera has no flash! !.The main camera lacks stability. Low back flash. the Samsung J7 2016-2017 model have better flash.Everything else is perfect!! Samsung Galaxy A9 (2018) smartphone was launched in October 2018. The phone comes with a 6.30-inch touchscreen display with a resolution of 1080x2220 pixels. Samsung Galaxy A9 (2018) is powered by an octa-core Qualcomm Snapdragon 660 processor that features 4 cores clocked at 2.2GHz and 4 cores clocked at 1.8GHz. It comes with 6GB of RAM. The Samsung Galaxy A9 (2018) runs Android 8.0 Oreo and is powered by a 3,800mAh battery. As far as the cameras are concerned, the Samsung Galaxy A9 (2018) on the rear packs a 24-megapixel primary camera with an f/1.7 aperture; a second 10-megapixel camera with an f/2.4 aperture; a third 8-megapixel camera with an f/2.4 aperture and a fourth 5-megapixel camera with an f/2.0 aperture. The rear camera setup has autofocus. It sports a 24-megapixel camera on the front for selfies, with an f/2.0 aperture. The Samsung Galaxy A9 (2018) runs Samsung Experience UX based on Android 8.0 Oreo and packs 128GB of inbuilt storage that can be expanded via microSD card (up to 512GB). 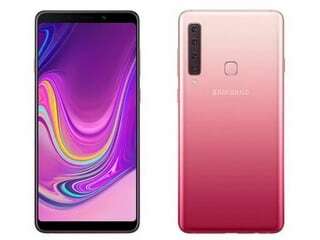 The Samsung Galaxy A9 (2018) is a dual-SIM (GSM) smartphone that accepts Nano-SIM and Nano-SIM cards. Connectivity options on the Samsung Galaxy A9 (2018) include Wi-Fi 802.11 a/b/g/n/ac, GPS, Bluetooth v5.00, NFC, USB Type-C, 3G, and 4G (with support for Band 40 used by some LTE networks in India). Sensors on the phone include accelerometer, ambient light sensor, compass/ magnetometer, gyroscope, proximity sensor, and fingerprint sensor. The Samsung Galaxy A9 (2018) supports face unlock. The Samsung Galaxy A9 (2018) measures 162.50 x 77.00 x 7.80mm (height x width x thickness) and weighs 183.00 grams. 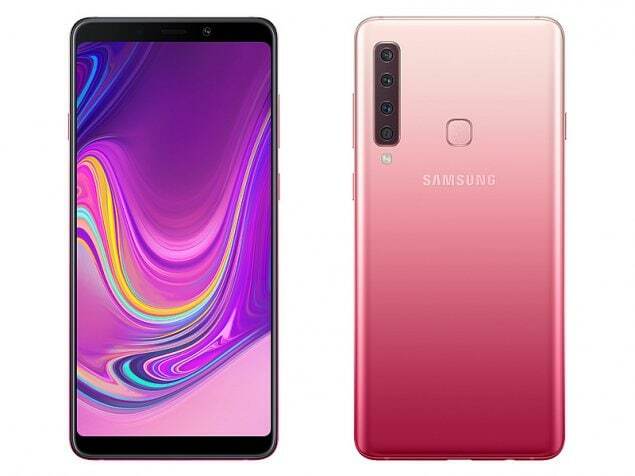 As of 21st April 2019, Samsung Galaxy A9 (2018) price in India starts at Rs. 27,490.